Srry if this has already been covered but i am getting some crazy max temp results from a new build, this problem happens even if i am just browsing web/youtube etc but the examples i have included happened after a few hours on Skyrim. As you can see i had HWINFO64 and CPUID running at the same time to compare results. If someone could shed some light on this it would be much appreciated. 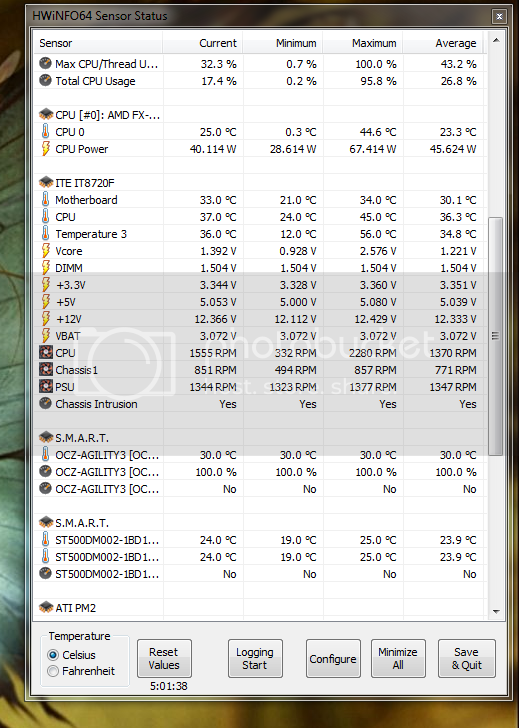 Im hoping they are false readings as the pc can run all day without any issues. Thanx in advance. And a well cooled case. Please try to run HWiNFO without any other monitoring tool in parallel to exclude a possible conflict. Let me know if that works different. Yeah I had done that a few days before I ran them in tandem and had a result of 172 degrees c just browsing thats why I tried CPUID. 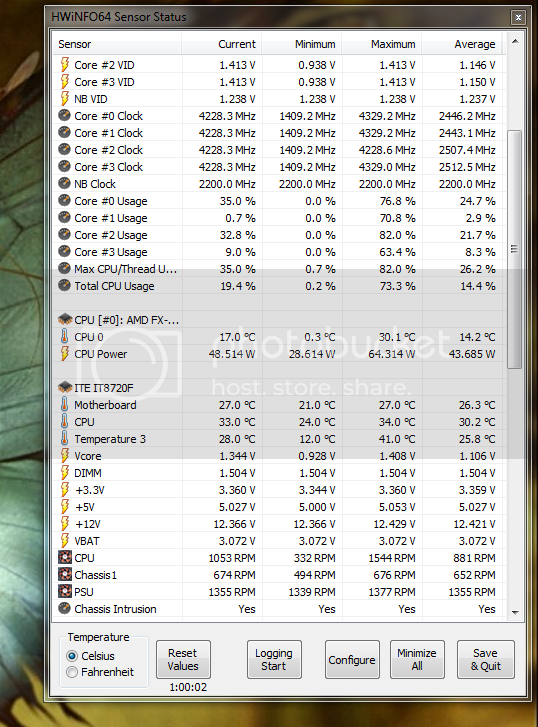 The temps just seem to be totally random and just appear out of nowhere but other than the northbridge heatsink being hot (which I understand is normal) I have seen no physical damage on the board or any weird behaviour from pc even when its been on for a few hours. Hope this info helps. I believe those are just invalid readouts of the sensors, so there must be something weird happening on the board. 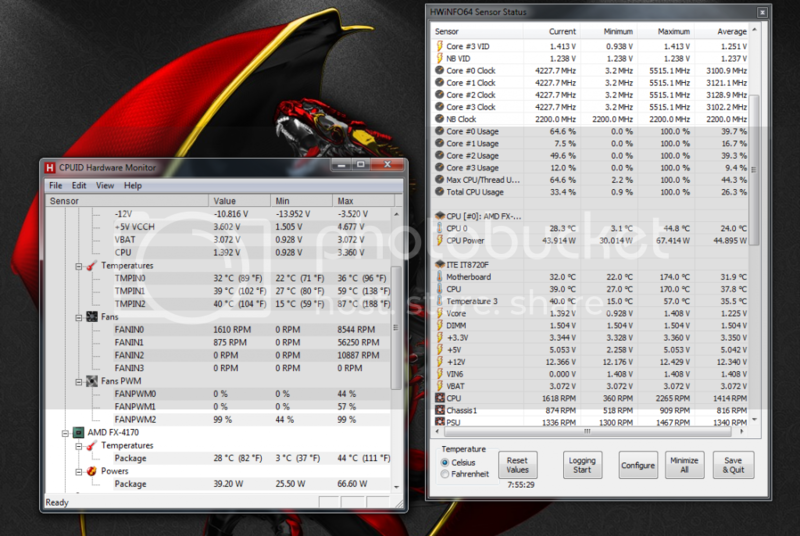 Have you noticed CPUID HW Monitor's fan min/max values? I think TMPIN2 max value is also a bit off there. So I think that CPUID HW Monitor is affected by a similar issue too. (05-13-2013, 07:53 PM)Martin Wrote: I believe those are just invalid readouts of the sensors, so there must be something weird happening on the board. Srry im new to all this, how do I get a debug file? I dont know if that uploaded? I don't see the file attached. (05-13-2013, 09:18 PM)Martin Wrote: I don't see the file attached. Ive got DBG file but it wont attach i will try again srry. Ok ive chosen file and added attachment but doesn't appear to be working? Srry about this but ive tried to upload the attachment and it won't do it, am i being thick or something? It might be too large, please try to pack it using ZIP, RAR, 7z, etc.. Thanks. I see a "sensorsview" device on your machine. Do you know what is that? Might this be something conflicting with other sensor monitoring tools? (05-13-2013, 10:06 PM)Martin Wrote: Thanks. I see a "sensorsview" device on your machine. Do you know what is that? Might this be something conflicting with other sensor monitoring tools? ah could that be Easytune6? there's also SensorView Pro but thats not running. Also had the problem before SensorsView was installed. And anyway - I suggest to run without any other monitoring tools in parallel. Otherwise if some of them don't play fair, it might cause such issues too. Ok i will try that, i have uninstalled SensorsView and will let you know results. Ok temps at the moment seem stable, i have included a .DBG file for you to see if anything showed up. Thx very much for your help so far, i will give that build a long test tomorrow and get back to you with the results, thx again for your help. I will continue monitoring this latest build over next few days and let you know if i get anymore wild temps. Again thx for your help much appreciated. That's great, thanks for the feedback.